What’s a bumbleberry, you ask? Head to Zion and find out! Last week, Erin told you all about our hiking adventure in the Narrows of the Virgin River at the north end of Zion Canyon. It was certainly the highlight of our trip, but we had a blast exploring the rest of the park, too. While the shuttle bus and the bulk of the tourists head to the Narrows, be sure to get off the beaten path and check out the other — lesser traveled — corners of Zion National Park. Zion is less than a three-hour drive from Las Vegas (faster, of course, if you don’t stop at the border for a photo of yourself in front of the “Welcome to Utah” sign … and at the Arizona border before that!). We made a quick stop on our way into Zion at the Springdale Fruit Company. Light on fresh produce, at least in mid-June, it offered healthy snacks, cold beverages, a nice picnic area, a deli, ice cream, and outdoor picnic tables in the shade of some beautiful trees. Our favorite item: spotting a bright red Summer Tanager among the trees in the orchard! Bird nerd alert! Three states in one day! Eager to get to the park, we passed our motel — the Bumbleberry Inn — and drove through Springdale, the touristy gateway town to Zion. Springdale offers restaurants, hotels, gift shops, groceries, and the like, but not in a gaudy Wal-Mart and McDonald’s sort of way. The town offers cute, low-slung wooden buildings, sidewalks, and a free shuttle bus to the park with many stops throughout Springdale. Whether you’re planning to visit the park or not, paying the admission fee is required, even to drive through. We are big fans of the Annual Pass, which, for $80, provides admission to all US National Parks and federal recreation sites (over 2,000!). Such a deal! We bought ours at Channel Islands NP last summer and, by the time it expires in August, we will have used it in six National Parks (and we should have used it in the Mt. Hood National Forest this spring…). 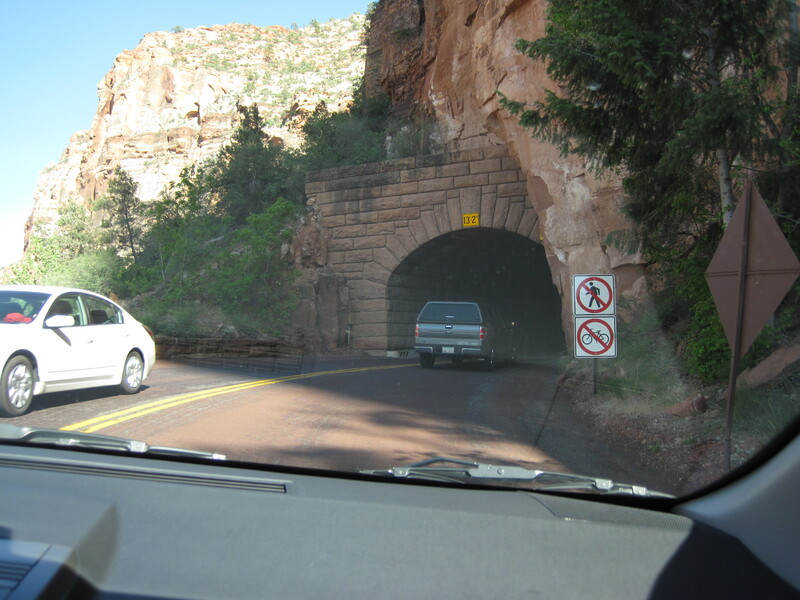 This blind — not freestanding — arch graces the Zion-Mount Carmel Highway just west of the tunnel. 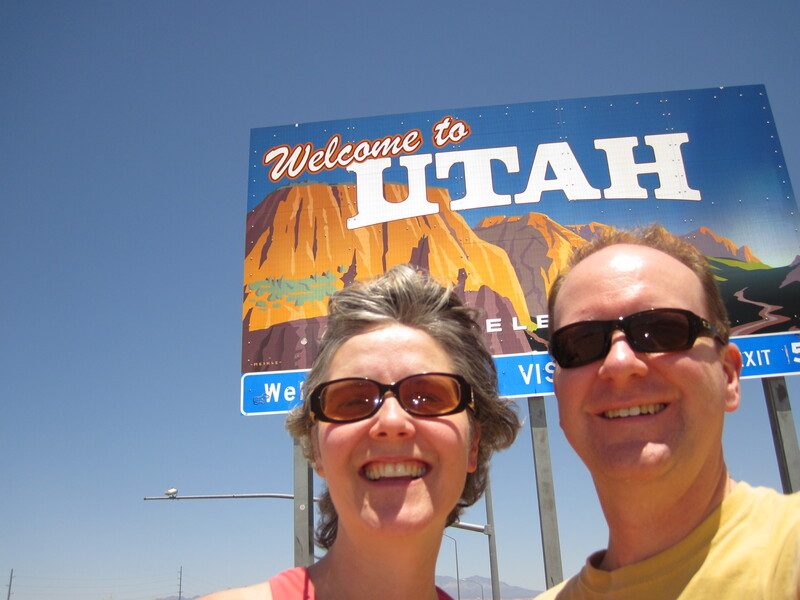 We bypassed the Visitor Center and the Zion Canyon shuttle, instead opting to drive east through the park. The road climbs up from Canyon Junction, the start of the dead-end spur road that’s closed to private vehicles — but a free shuttle snakes into Zion Canyon past landmarks like the Court of the Patriarchs, Emerald Pools, Zion Lodge, Angels’ Landing, Weeping Wall, and Big Bend on its way to the mouth of The Narrows. Saving that trip for the next day, we drove eastward and upward. The massive Great Arch, tucked in a valley north of the highway, provides a massive reminder of the power of erosion. Although not crowded, the viewpoint offered some great people-watching as well — from rock climbers wrapping up their day to tourists from around the world. 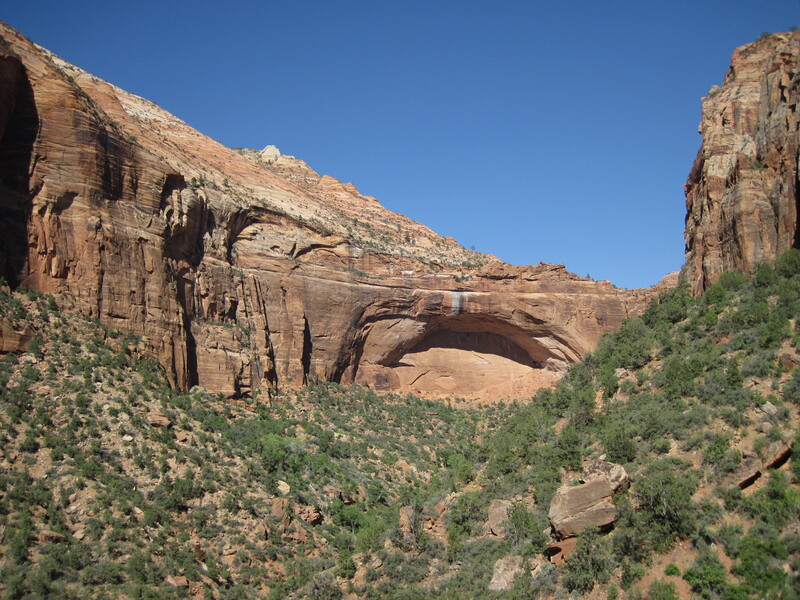 The 1.1-mile tunnel was once the nation’s longest and remains the link between Zion’s center and east side. 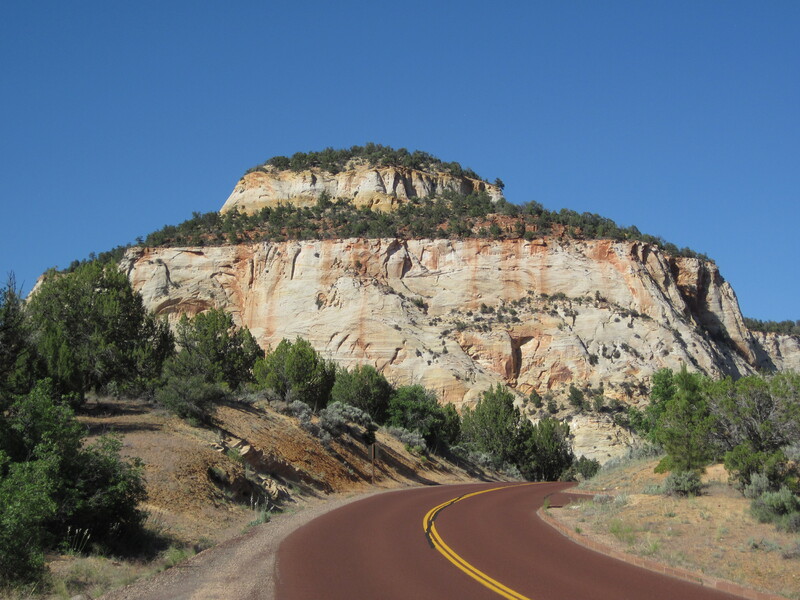 We continued the drive, which quickly became a series of switchbacks en route to the 1.1-mile long Zion-Mount Carmel Tunnel. The nation’s longest when it was built in 1930, the two-lane tunnel prohibits bicyclists and pedestrians and has restrictions on large vehicles. Upon driving into it, we understood why! It’s pitch black and narrow inside, with a few occasional windows that provided Erin a glimpse of the valley outside (I was too busy trying to dilate my pupils to be able to see the road — did we mention it was dark?!?). On the other side of the tunnel, the landscape opens up a bit and the geology changes, too. 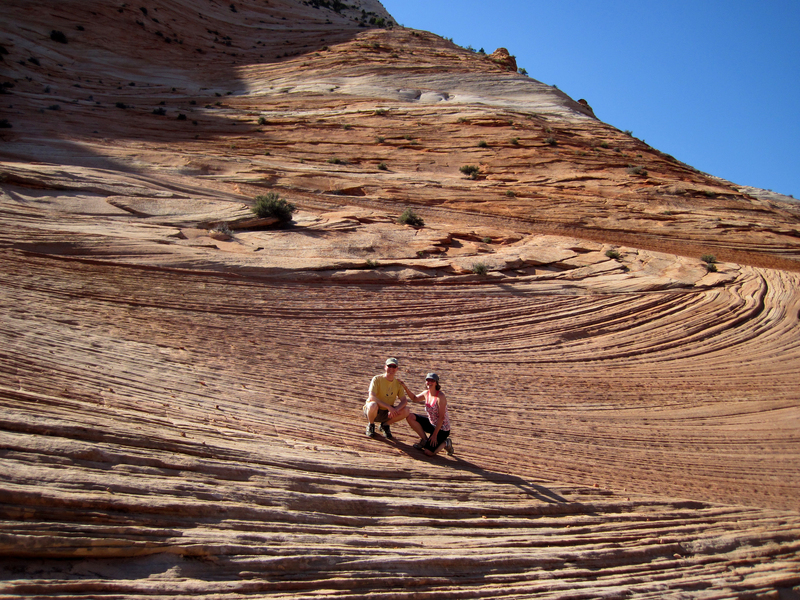 The sandstone of Zion Canyon gives way to slickrock mesas, the most prominent of which is the aptly named Checkerboard Mesa. While there are only a few turnouts between the tunnel exit and the park’s east entrance, there are opportunities to get out and explore. 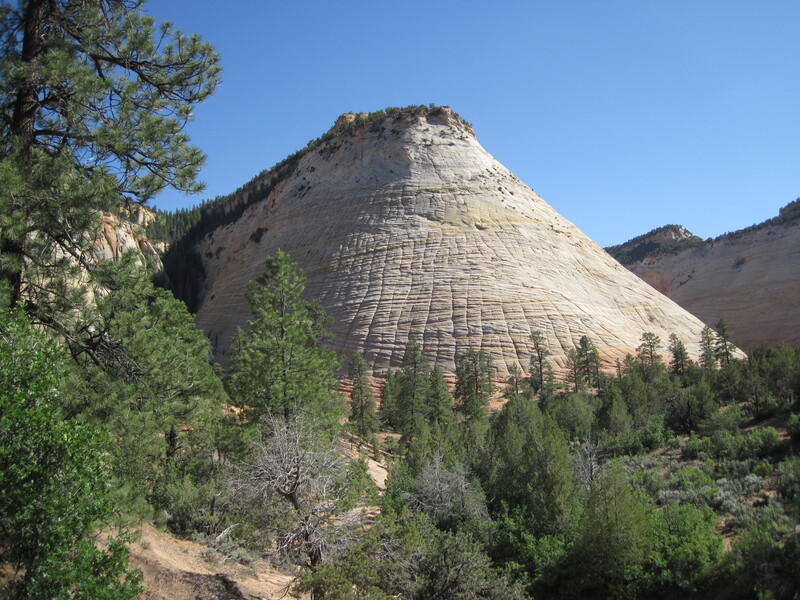 Aptly named Checkerboard Mesa near Zion National Park’s east entrance. After snapping a few photos of Checkerboard Mesa, we climbed up a veritable funnel of slickrock and had a great view of the surrounding mesas. Then it was back through the tunnel to the Visitor Center to get some tips for birding and for our upcoming Narrows hike. Watchman Campground, adjacent to the Visitor Center, offers some shade trees as well as proximity to the Visitor Center, Springdale, both shuttle buses, and the cooling water of the Virgin River. After picking up a picnic dinner at the Sol Foods market and hitting the pool at our hotel, we headed over to the Bumbleberry Bakery for some dessert: bumbleberry pie! So what’s a bumbleberry? Part blackberry, part blueberry, and part tall tale (the bakery offers some fun folklore about it), we’ll just say that it’s tasty! Maybe you’ll have to visit Zion and try it for yourselves sometime! Have you been to Zion? Have you eaten the famous Bumbleberry pie? Or driven through the tunnel? Or played on the slickrock? Let us know in the comments, and enjoy your week or your weekend! 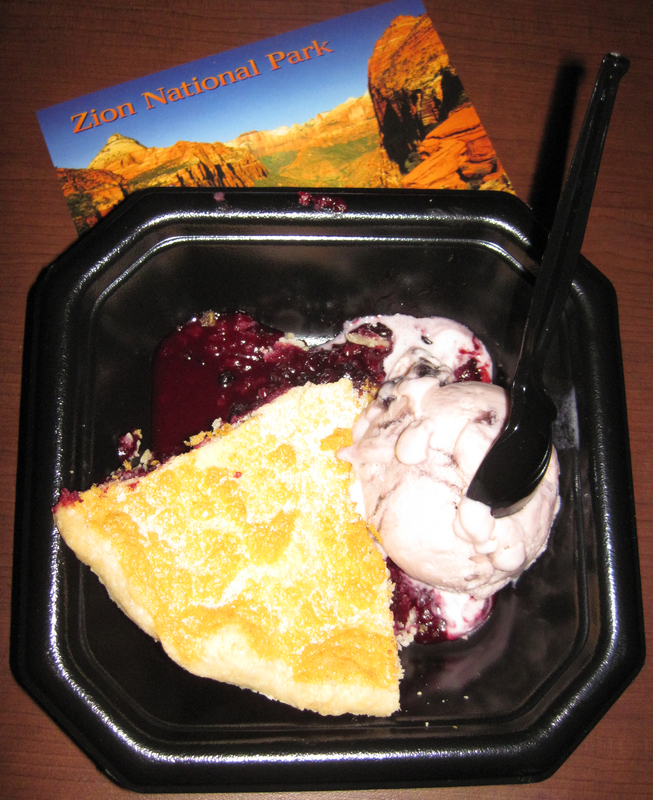 Bumbleberry pie sure hits the spot after a long day of hiking! Great tips! How long does it actually take to drive that winding, tunnely stretch to the east side? Oh, it only takes a few minutes. It’s just a mile long. We had to wait longer to actually get into the tunnel (large vehicles have to drive escorted down the middle, so there’s sometimes a wait). Really, one person should drive one direction and the other person the other direction so each person gets to look out the windows! Have fun! You MUST do that river hike when you go, Dana. Get some poles and go for it. It’s the best thing ever! Thanks for reading. Enjoy your week or your weekend!